New pictures from the 25 Mile Ride on the Somerset Levels and also pictures from the Bristol Memorial Ground Walk!! Great news!! The Vine Surgery collection raised a brilliant £43.87!! Thank you!! The zebrafish can heal its own heart if it gets damaged. My name is Neil Morgan. I grew up in Ashcott. My parents Bridget and Terry, my brother, Ian and sister Vicky. For me wonderful memories, of the old school, the playing fields, Cub Scouts, Halloween, Bonfire Night, how amazing was it buliding our own fires, dragging old wardrobes around the village. The fireworks and who won the guy competition, the hot dog tent!. Snow and Christmas, at home, school and Church, forever remember singing Carols down Middle Street. The old swimming pool in the summer holidays, the hot tarmac on your feet, followed by an icecream, wonderful times! In 2009 completely without any warning my mum Bridget Morgan passed away. 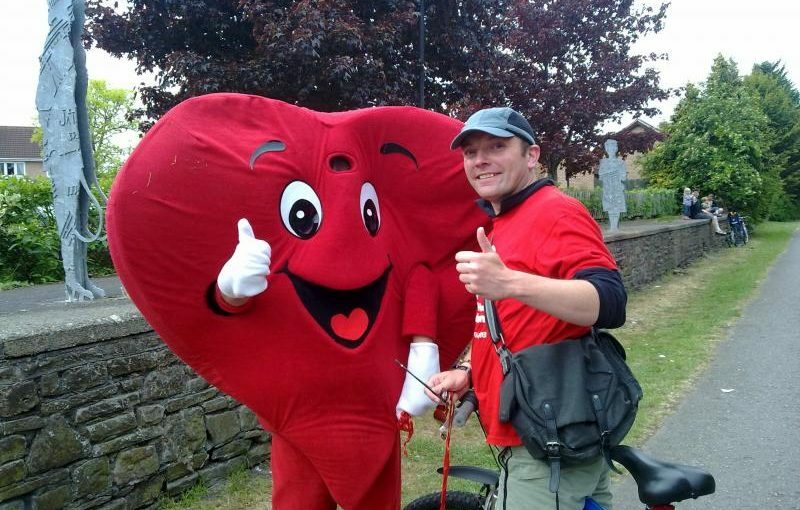 I have been a volunteer for the British Heart Foundation for over a year now, out and about collecting. This year I am participating in a series of events to raise awareness and hopefully raise donations to the current ‘Mending Broken Hearts’ Campaign. I am taking part in a series of events this summer, Bristol to Bath Bike Ride, (COMPLETED), Somerset Levels 25 mile Bike Ride (COMPLETED), Memorial Ground to Clifton Walk (COMPLETED), Weston Super Mare Seafront Walk and Peak District High Peak Trail, 17 miles. I have also a couple of events of my own in discussion with various organisations, this I will update. Thank you for taking the time to visit this page, thank you to all in Ashcott that were so very kind and supportive to my family . If you feel able to forward my fundraising page to family and friends I shall be so very grateful.